We recently challenged budding bloggers and stylists alike to create their ultimate Winter Flatlay showing us how they STYLE THE SEASON. 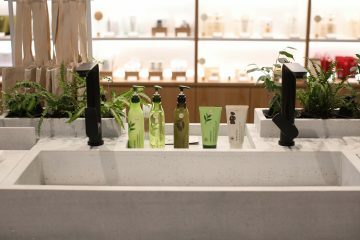 There were entries from across Australia, all competing for a $1000 David Jones Shopping Spree as they created looks using new season David Jones product! 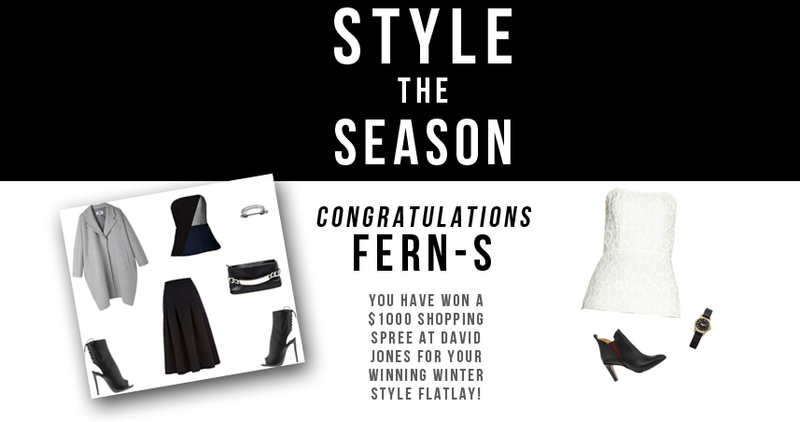 Editor-In-Chief, Lisa Teh, chose FERN-S Fashion Blog as the winner because of it’s unique range of textured pieces and mix of understated Winter effortlessness. Fei teamed geometric knit’s with leather and polished hardware which created the ultimate in style for this season. 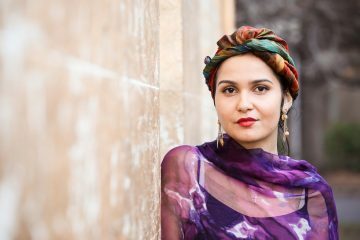 We spoke to Fei from FERN-S Fashion Blog about her winning look. I am a student from Melbourne. ‘FERN-S’ is a fashion/personal style blog which stemmed as being a personal source of inspiration and creative outlet of all things that inspire me. Since a year of it launching, it has grown to incorperate a bit more of my own personal styling and outfits. I’d describe my style as being very classic and minimal. In my opinion there is nothing better than a balanced, uncluttered outfit that exudes simplicity and an effortless sense of style. Tell us about the inspiration behind your winning flatlay. I was inspired to create a timeless Winter look, incorperating thicker materials of the current season favourite; neoprene and the always classic leather, with darker black, navy and grey hues as an ‘evening dressing’ outfit. I am always inspired by making minimal dressing bold and alluring as seen again on the way runways from brands like Céline.. not to mention the A/W 2013 range. You did a few flatlays, which one was your favourite and what was the inspiration behind the rest of them? Definitely the ‘evening dressing.’ It’s my definition of the perfect Winter’s evening outfit with thicker luxe materials, clean cuts, minimal colours and the subtle silver hatch-cuff and chain detail on the clutch which gives the outfit a bit more of that edginess charm. My inspiration for the other styled outfits was to create simple, classic looks in-cooperating a few in-season favourites and Winter wardrobe must-haves. Now that you’ve given us some tips for dressing in Winter, what are your tips for Spring? For Spring, I would personally look to more neutral hues and clean whites as well as light weight layers and slouchy silhouettes. Warmer days also calls for some open toe action in the form of mules or slides (you either love or loathe them) after keeping them snuggled up in your wardrobe for so long during Winter! What pieces are you going to purchase for the upcoming season from David Jones with your $1000 shopping spree? Definitely a few pieces from the new season Dion Lee Line II and Bassike, being two of my favourite Australian designers!